Iraqi forces backed by American troops are pressing ahead with a major operation against insurgents in the north-eastern Iraqi province of Diyala. The region is one of the last al-Qaeda militant strongholds in the country. The operation was launched at dawn on Tuesday. A curfew was imposed across the province as troops and police deployed in its capital, Baquba. In Baghdad, a major Shia festival ended peacefully, after twin bomb attacks on Monday killed at least 25 pilgrims. On Monday, a suicide bomber targeted a crowd of Kurdish protesters in the northern city of Kirkuk, killing 22. A US army spokesman in Iraq said the goal of the operation in Diyala was to destroy what he called criminal elements and terrorist threats in the province, and to eliminate smuggling in the region. Security officials searched houses in Baquba, confiscating weapons and detaining suspects. 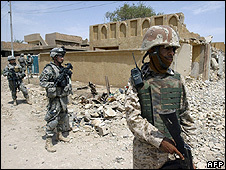 As well as the deployment in Baquba, Iraqi and US forces conducted raids in several outlying areas. Security sources said a number of wanted people had already been detained. A local resident told the Agence France-Presse news agency that he welcomed the operation, despite the inconvenience of road closures and checkpoints. "I only wish the operation had come earlier and we would have not lost so many of our sons and friends here due to the bombings," said Ibrahim Hassan Ahmed. Diyala province has proved to be one of the most stubborn areas to pacify following the success of the calming of former hotbeds of the insurgency such as Anbar province to the west of Baghdad. There have been similar major operations in the province in the past, but they have all been so loudly heralded that insurgents had plenty of time to escape, regroup and stage a return later, BBC Baghdad correspondent Jim Muir says. However, local sources said such operations did have some success as they confined insurgents to two pockets to the east and west of Baquba. This latest operation was generally expected but its timing was kept secret, and army and police units were brought up from Baghdad unannounced. There was no significant sign of the violence and destruction that marked operations in the area last year. In Baghdad, the authorities lifted a vehicle ban imposed as a two-day mourning ritual for the death of an important Shia historical figure, the Imam Musa Kadhim. "I congratulate the millions of people and the mourning processions which took place with the utmost organisation, showing great co-ordination with the armed forces," said a statement from Prime Minister Nuri al-Maliki's office. Hundreds of thousands of Shia pilgrims made their way on foot towards the shrine in Khadimiya, in the city's northern suburbs, for the climax of the festival. Many of them walked for days, coming in from outlying areas to the south of Baghdad. Our correspondent says it is when they are on the road that the pilgrims are at their most vulnerable, as the bomb attacks on Monday showed. Police say it is virtually impossible to provide complete protection to large numbers of people moving on foot over a wide area, especially against suicide bombers also moving on foot. Monday's bombing was carried out by two women who are particularly hard to deal with as they can conceal explosives under their long black robes.